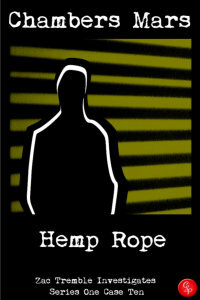 In Hemp Rope, Zac is tracking down the son of a Press Baron. The son, Henry, is getting into some heavy drugs and seems hell-bent on destroying his life and his father’s reputation. Richard Chiverton, CEO of Mercury Press has made it his personal crusade to vilify any public figure involved in drugs. Henry is about to find himself on the front page, unless Zac can find him. James joins the agency, having been axed from the Force. Zac is struggling after what happened in NYC; Elizabeth’s ample bosom is working overtime. Things have to turn a corner; the identity of the imposter who visited Zac in his hospital bed in New York is the only hope Zac has of finding out exactly what happened to Paul. Hemp Rope is the 10th Zac Tremble Case File in the series Zac Tremble Investigates; the case files of the gay, Soho-based PI Zachary Tremble. It follows on from, in order: Chrysalis, Metamorphosis, Transmutation, The Red Kimono, The Ephemeris Protocol, Delphes, Slip Knot, Hide and Seek and Some Like it Strange. There are twelve case files in series 1. And if you can’t wait for the first twelve cases to appear individually, then Jury’s Out is also available – Jury’s Out is the complete first series.